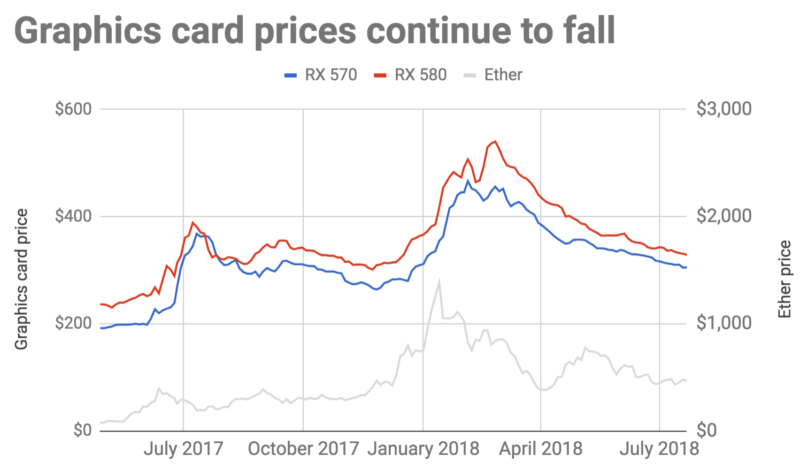 The falling price of ether has pushed down graphics card prices. About a year ago, graphics card prices started to go crazy. Then in early 2018, things got even crazier. The price of a Radeon RX 570—a mid-range graphics card popular for cryptocurrency mining—soared from under $200 in April 2017 to over $450 in February 2018. Over the same period, a high-end RX 580 soared from around $230 in April 2017 to as much as $540 in February 2018. But since then, graphics-card prices have been falling steadily, according to data collected by PC Part Picker. An RX 570 fell to around $350 by the end of April. And you can now get one for a bit more than $300. An RX 580 now goes for around $330. When I visited my local Best Buy back in January, the store was asking for $529.99 for a Radeon 580 with 8GB of memory—and the store didn’t even have them in stock at that price. By late April, the same card was available from Best Buy’s website for $419.99. Now, the same card is selling for $339.99. These cards still have room to fall—they’re still well above the prices of early 2017. But the steady downward trajectory suggests that the insane price increases of late 2017 and early 2018 are over. A similar pattern can be seen with Nvidia’s GeForce graphics card lines, according to data from PC Part Picker. Nvidia’s high-end GeForce GTX 1080 graphics card peaked at more than $800 in February. It has since fallen to around $600—about the same price as it sold for in early 2017. Similarly, a GeForce GTX 1070 has fallen from around $700 to around $500 over the last five months—just slightly above the $450 or so these cards fetched before the cryptocurrency boom began in mid-2017. Unsurprisingly, this has come at the same time that ether, the currency of the Ethereum network, has been on a steady downward trajectory. Ether is only the second-most valuable cryptocurrency, worth far less than bitcoins. But bitcoin mining isn’t economical with graphics cards because the bitcoin mining market has long been taken over by energy-efficient ASICs. So for the last year, the value of graphics cards has been largely driven by the value of ether. Next articleHODL CARDANO! Something Big is Coming!